I'm a totally geek. To celebrate Harry's birthday (july 31st) this year I made some aprons including this one for my little niece. 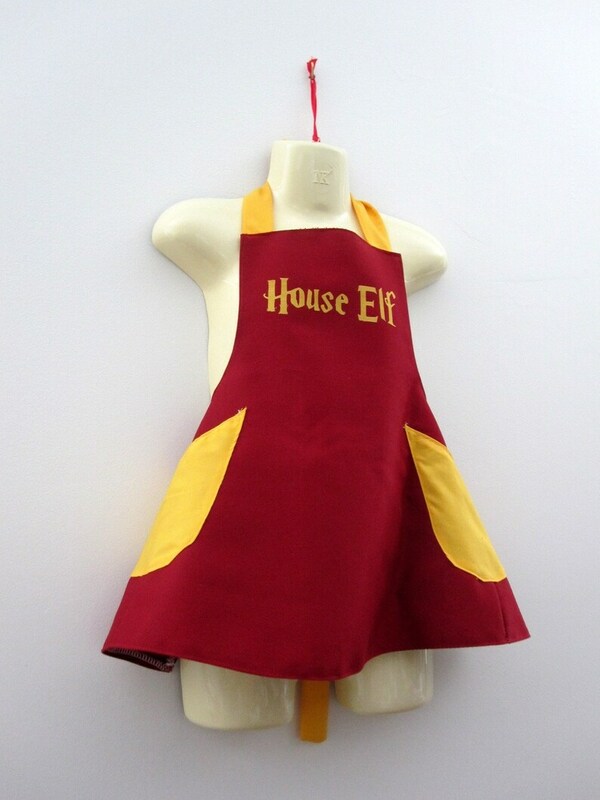 Put this darling house elf apron on your little one and give him or her a sock to carry around and you've got the perfect costume for Halloween, the next movie premiere or your own party. This is made out of a light weight rich maroon colored fabric topped with golden rod straps and pockets and fabric "house elf" across the bodice. If you would prefer a different Potter phrase like in the last few pictures just let me know. Other colors available see below for details. I can do colors of the other houses (or names) with a custom order. If no other color is requested I will do it the same as the picture. Please message me prior to ordering about the possibility of custom colors and phrases. Please note customization may require extra time depending on my current workload..